Thursday, May 19, 2011: Up early and on the road at 0850 under partly sunny skies and temperatures in the sixties. Leaving the campground we took a detour into Wawa Center to see if we could find out why a perfectly nice town would be named Wawa. Our fascination with the word “Wawa” stems from the many pleasant visits we have made to our relatives in Philadelphia. My Uncle Don, in particular, loves to give directions on how to get around the area, and he uses geographic references such as: “Go down Main Street and turn left at the Wawa. When Kit and I first heard this many years ago we had no idea what a Wawa was but figured we would know it when we saw it. Turns out a Wawa is a chain of 24 hour convenience stores primarily in the Mid-Atlantic States. However, this Wawa is a village of 3,000 folks nestled between the east shore of Lake Superior and Lake Wawa (of course). And we are happy to report that the mystery is solved! 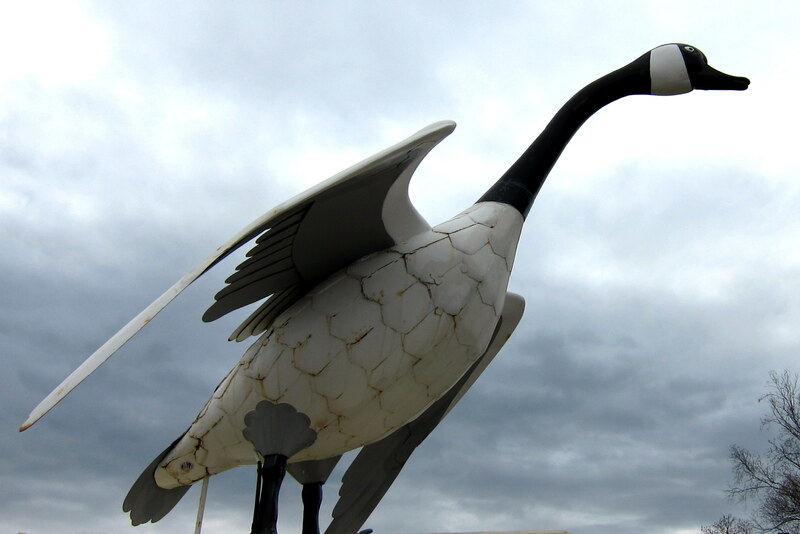 We learned at the Wawa Visitor’s Center that the term Wawa is taken from the Ojibwa word for “wild goose”. Now, as a point of clarification…..a wild goose is not something one may experience in a crowded elevator, but a huge honkin (pun intended) manure producing bird. As punctuation to this factoid the town celebrates its goosyness with a monumental sculpture that overlooks the town. Parking truck and trailer along the shore of Wawa Lake to take a look around, we were approached by a local, that at first, I had taken for a panhandler or peddler. However after exchanging pleasantries and hearing a brief history of the area’s history, Paul presented us with a chunk of Amethyst. 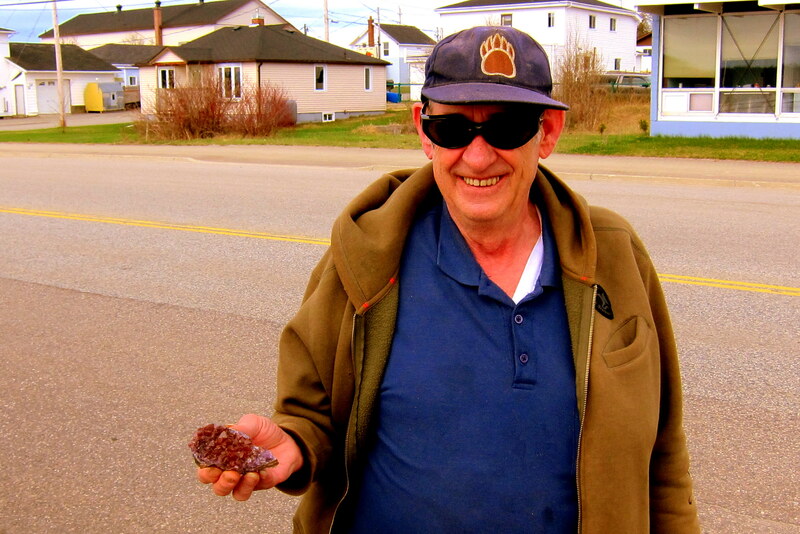 He is retired a retired Iron Ore miner and has an active claim on an Amethyst mine north of town. Being a hobby operation, most of the gemstones he uncovers go to family and friends, however some he sells to a jeweler. He was quite proud of the fact that, at age 71, he was still digging in a mine. And for the fact that he only had to pay the government $20.23 for the mineral rights to his 40 acre claim. 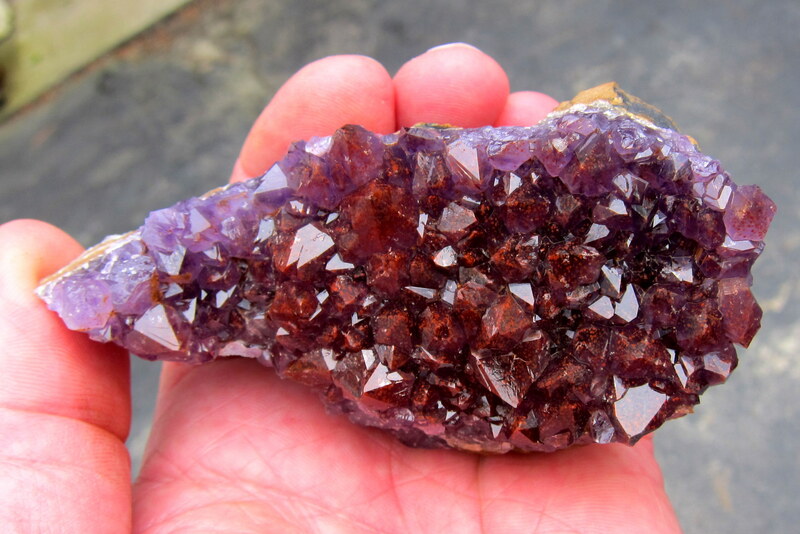 Here is a close up of the stone that Paul gave us and would take nothing in return, what a nice gesture by a local to a couple of traveling gypsies. 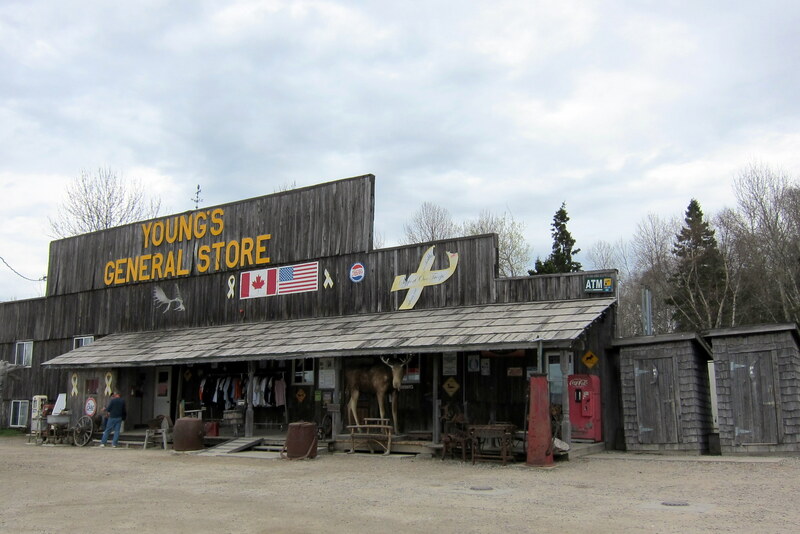 After a delightful hour talking to Paul we moseyed back to the highway but not before stopping at Young’s General Store for fuel and provisions. Young’s is an old timey country store. The type that if you need something, there’s a good chance they have it. Kind of like a small, responsible, comfortable and sane Wal*mart. Kit spent quite a while looking for a stuffed Wawa which now rides alongside Mr. Bill in the cab of our truck. 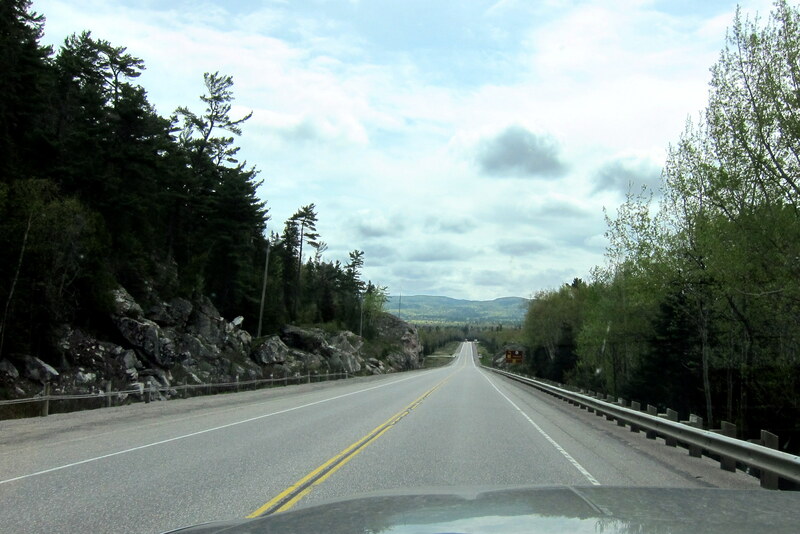 By 1040 we were back on Highway 17 and once again were paralleling the northeast shore of Lake Superior. We have been poking around this magnificent lake for the past ten days and would like to spend even longer. However we are getting anxious to be home with family and friends and to explore some Maine lakes we love as well. So we continue to march on. 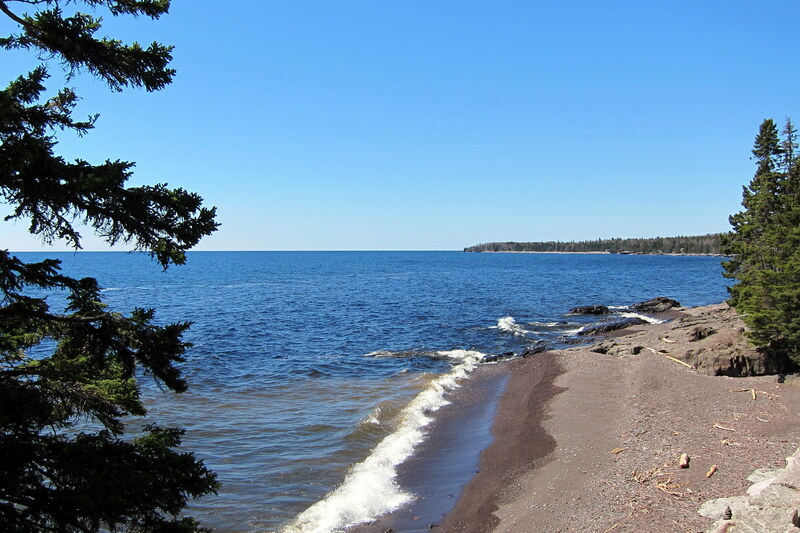 Soon we enter Lake Superior Provincial Park and, although they were not yet open for the season, most of the turnouts and access roads were open. 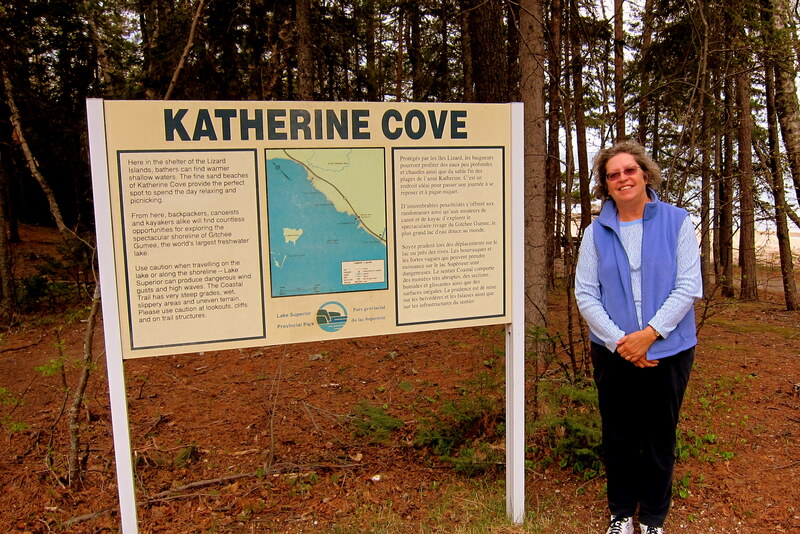 One such road led to Katherine Cove, so of course we had to pay a visit to Kit’s namesake bay. Like Kit, the cove was tranquil and beautiful. Points scored by Bill, and boy, do I need them!! 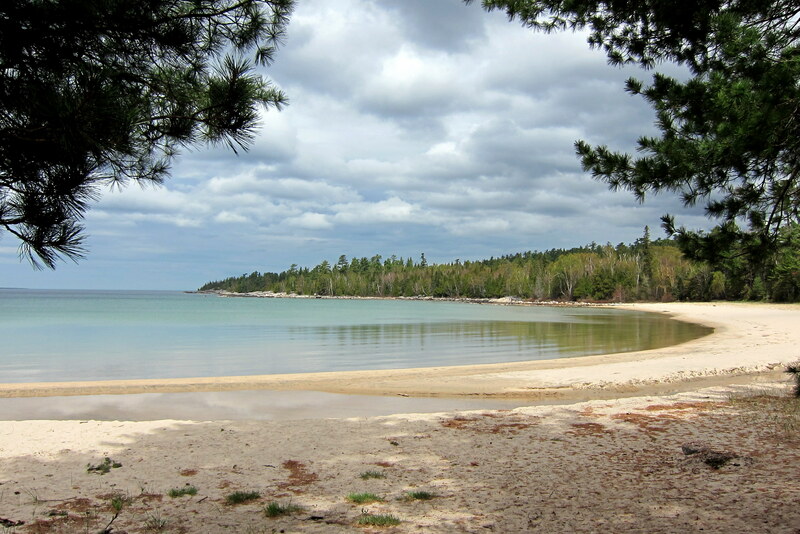 Lake Superior Provincial Park features a number of rivers and ponds with creative names. There was an Old Woman River, a Dad Lake, a Mom Lake and a Baby Lake, as well as an Orphan Lake. Must be a story behind those names but haven’t a clue what it might be. In order to remind us that winter only recently left this area, there were a number of spots along the shadier portions of the shoreline that still contained snow. Pulling into Sault Saint Marie, Ontario we decided to take a break to poke around a bit. As if the town planned it, there was a shopping center in close proximity to the Bushplane Museum. Can you guess who went where? 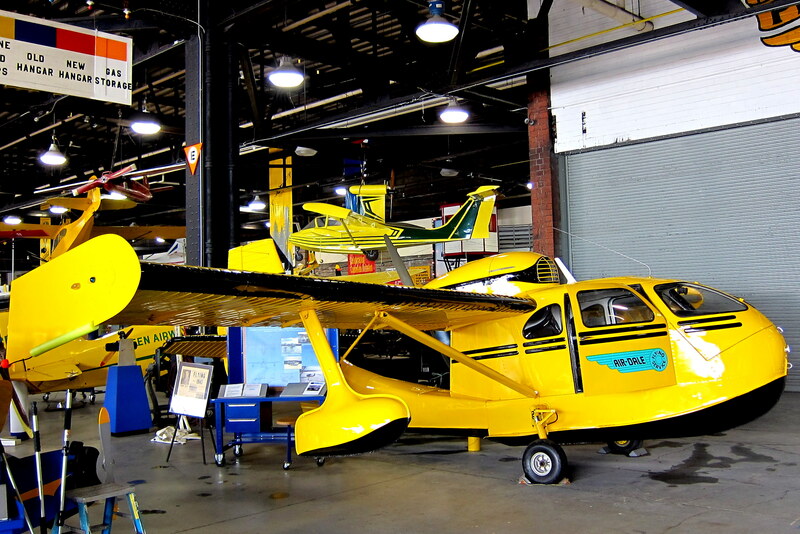 The Bushplane Museum celebrates those brave souls that take off and land on water or snow, often in remote areas, and often in heavily wooded terrain. Some do it for sport, some as a job, and others because they can. 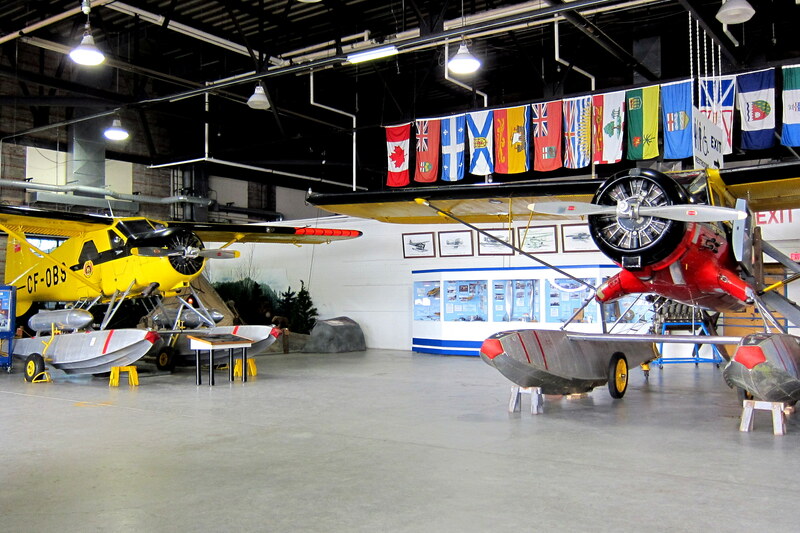 The museum is fairly small but has an extensive display of aircraft. And others big and old. After Kit and I reconnected we sat in the parking lot and discussed what to do next. This meeting of the minds takes place on a regular basis. Since we don’t have a formal itinerary or deadline we frequently decide real time where to go and what to see next. It was during this session that Kit remembered our friends Herb and Jennifer. They had RV’ed through here a number of years ago and told of a really nice campground right on the Saint Mary’s River. However it was in the US…..a mere 2 miles away but required another border crossing to deal with. Deciding it was worth it we headed south, crossed the International Bridge, and re-entered the states. Asking the pleasant border agent about the campground we were directed east along the river. 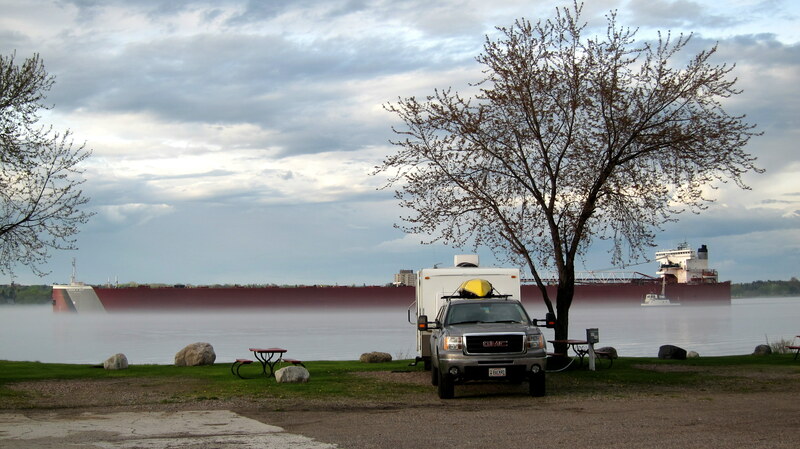 Soon we came to Soo Lock Campground and chose a nice site overlooking the main shipping channel. Within a half hour a large 1000 foot Ore Carrier trundled past. It seemed close enough to touch and was followed by many more before the fog rolled in and slowed the traffic. 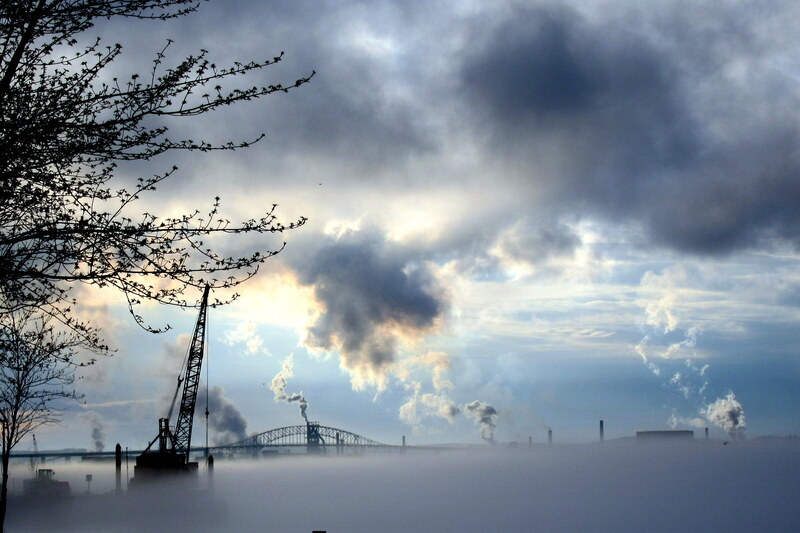 The combination of a cloudy day, the setting sun and developing river fog created some dramatic photo opportunities. That’s the International Bridge in the distance that connects Sault Saint Marie, Michigan to Sault Saint Marie, Ontario. 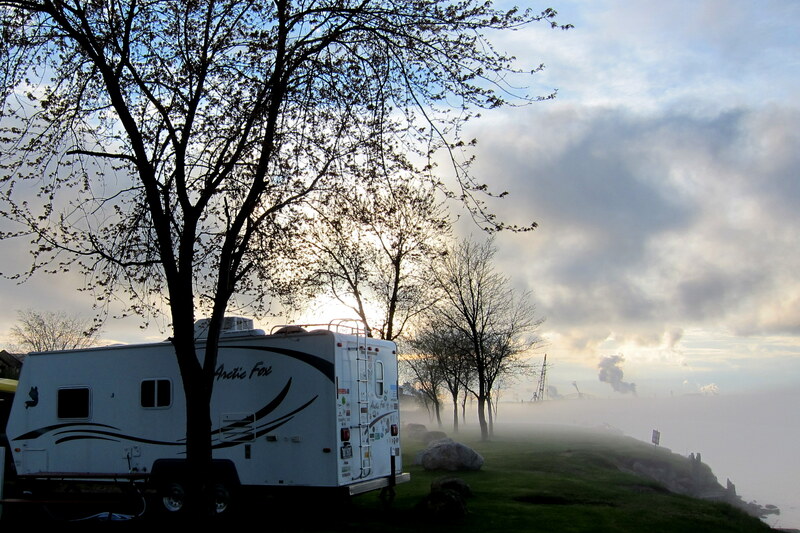 Friday, May 20, 2011-Sault Saint Marie, Michigan: It’s 0530 and must still be foggy as we were woken by a fog horn. However we didn’t mind because it gave us an opportunity to watch another massive ship slowly navigate the narrow channel of the Saint Mary’s river. 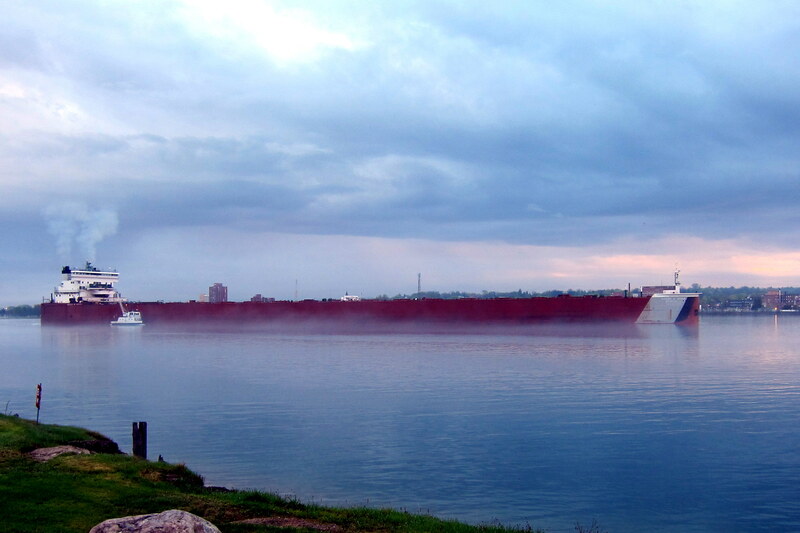 As if on cue, the rising sun started to burn the fog off and the Lake Freighter came into view. The little white boat alongside her starboard beam looks to be a replenishment boat. We had been noticing that this same boat would leave a dock next to the campground and make its way to the freighter. It would then parallel her course and speed and use its crane to lift pallets onboard the freighter. This “underway replenishment” took about fifteen minutes. Then the boat returned to her berth to on-load for the next mission. Where did all these large cargo ships come from, what are they carrying and where are they going? Deciding we had to explore this area further, we disconnected the truck, paid for another night in the campground, and headed into town. Starting at the Soo Locks Visitor’s Center, which is hosted by the US Army Corps of Engineers, we learned that the Soo Locks were built in 1855 in order to provide navigation around the rapids of the Saint Mary River. 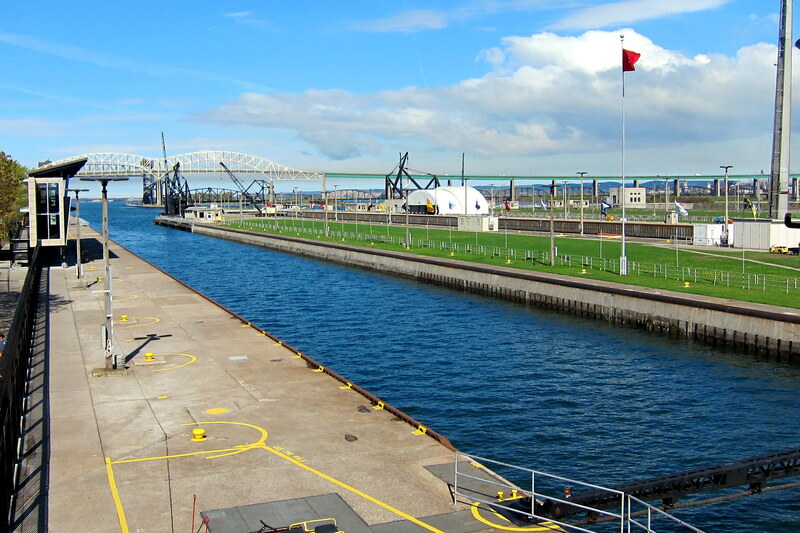 The locks allow free passage of some 10,000 cargo ships a year, which have traveled to this point from all over the world, to continue their voyage into Lake Superior. Most of these ships are bulk freighters carrying iron ore or grain. 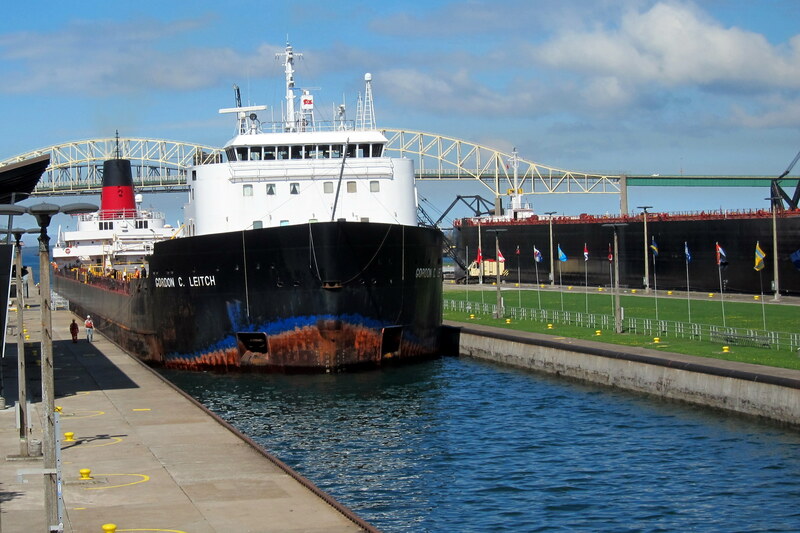 The Soo Lock system has been enlarged and improved over the years. Of the four individual lock basins the Poe Lock, named after its engineer Orlando Poe, is the largest. 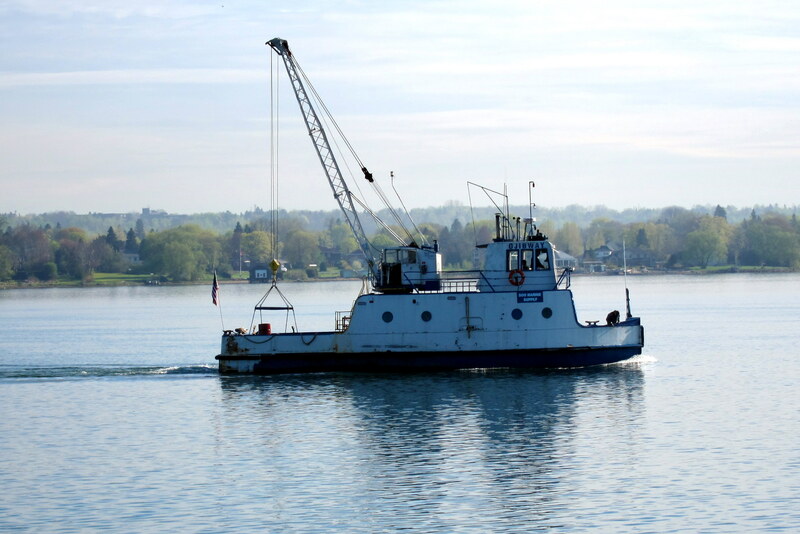 Built in 1968, as a response to the opening of the Saint Lawrence Seaway, this 1,200 foot long by 110 foot wide lock spawned a new fleet of Super Laker’s. 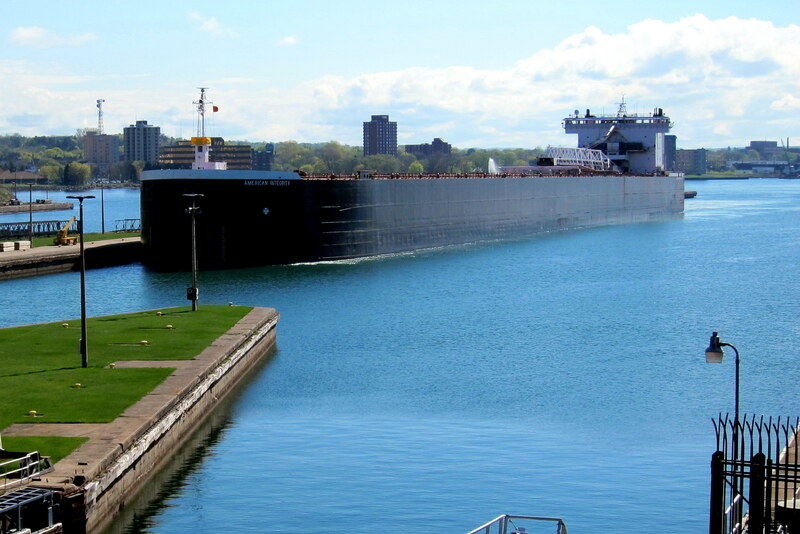 The following photo shows the 1,000 foot long by 105 foot wide SS American Integrity entering Poe Lock. Yep, when these babies transit the lock they only have 30 inches clearance on either side. This fact probably explains the scrape marks along the ships waterline. In building the Poe Lock an environmental issue was created. For years the Great Lakes has been a prime sports fishing destination for those fisherfolk searching out the Coho Salmon, the Walleye Pike and the Muskie. With the larger lock basin all three fish were able to “intermingle” (if you know what I mean) and the hybrid offspring became known as Co-wall-ski’s. OK…..I’m waiting for the groan…..I can’t believe I used so many words for such a lame joke…..and I may have inadvertently offended some of my Polish family and friends as well…..sorry. The US Army Corps of Engineer’s plans on replacing the two oldest locks with another super basin but will likely not go larger than 110 feet wide in an effort to keep the ships at a manageable size. After a nice lunch at a local restaurant we poked around a few shops and returned to the campground to relax and watch more ship traffic pass by. Saturday, May 21, 2011: Up and on the road by 0945. It is partly cloudy and 66 degrees with a gentle breeze. After fueling up on some “cheap” US gas we once again crossed the International Bridge into Canada so we could reconnect with the Trans Canadian Highway. As we moved more inland we passed many small farms and drove through many small farming towns. 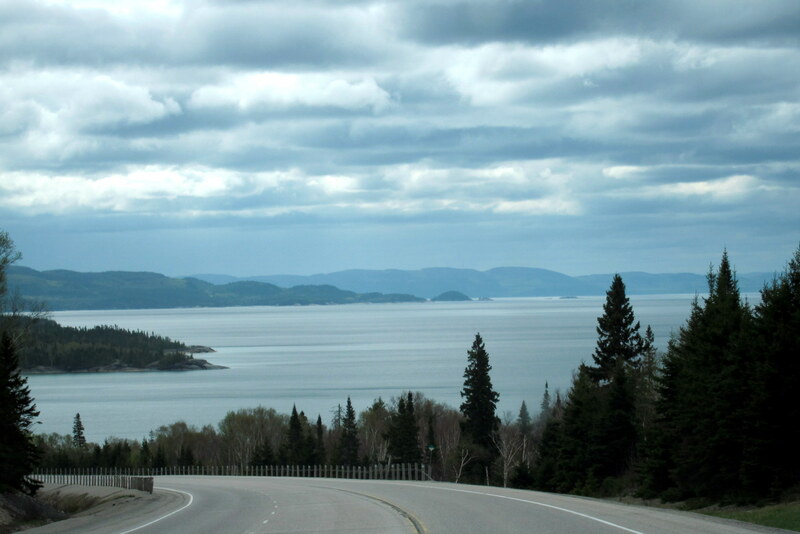 The opportunity to drive pointy roads increased as we left the Lake Superior shoreline. Passing a marshy area, Kit noticed a Bull Moose grazing on the underwater vegetation. No place to safely turn around to take photos so we just kept moving east. In a few hours we moved back closer to the lake front. Here we stopped for a rest at a wide spot in the road on the north shore of Lake Huron. On the outskirts of Sudbury we pulled into a Tim Horton’s for an afternoon cup of coffee and to discuss our next move. Our (my) original plan was to follow the shoreline of Lake Huron south to Toronto then drive along the north shore of Lake Ontario heading east. However this route would add 200 plus miles to our remaining trip. So considering we were in Toronto a few years ago, and that Lake Ontario is within striking distance of our home anyway, we decided to head inland on highway 17 and take the more direct route towards Ottawa. As we left the coffee shop we noticed a group of folks on the leeward side of out trailer milling about. 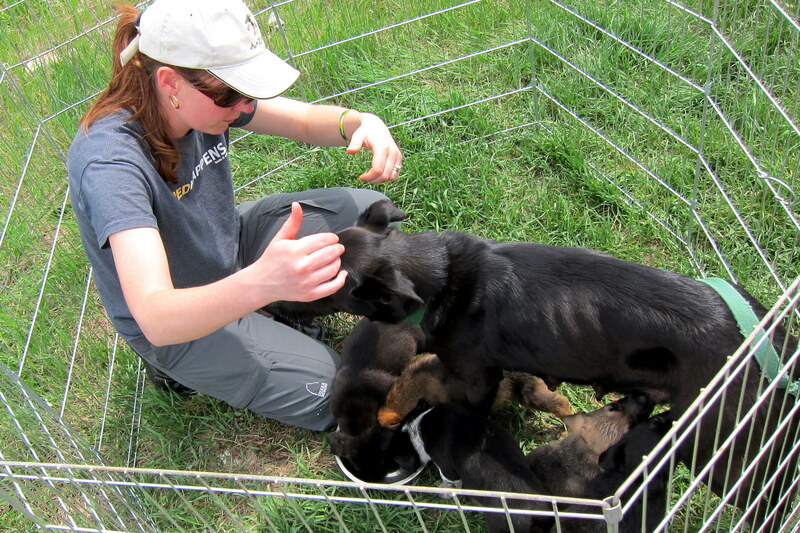 Turns out they were from the group Animal Rescue Foundation (ARF) and were using the windbreak to set up a portable kennel to feed an abandoned mom and her puppies. Had a nice chat with them and hearing all about their mission. Mom and babies are on their way to a small town outside Montreal where they await adoption. At 1410, it is 81 degrees. Funny how just a few miles inland from the lake’s the temperature climbs dramatically…..kinda like the coast of Maine. Since it was now getting late we pulled off into the nice little town of North Bay on Lake Nipissing. 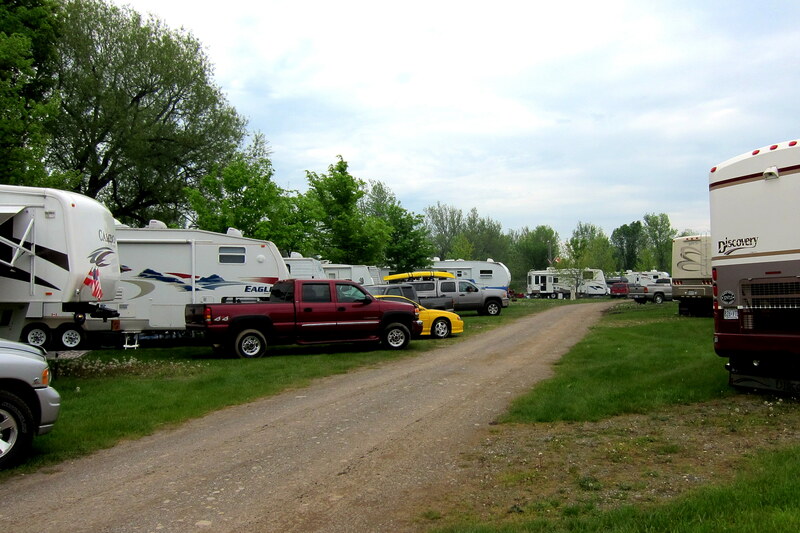 After a nice drive along the lakeshore we found the Fairview RV Park. After entering the facility it was obvious this was a residential park full of seasonal homes. However the manager allowed us to stay anyway and set up on a site that the owner had not yet occupied. Sunday, May 22, 2011: Up and on the road by 0910. It is cloudy and cool with temperatures in the 50’s. We are two days out and getting excited about returning home. 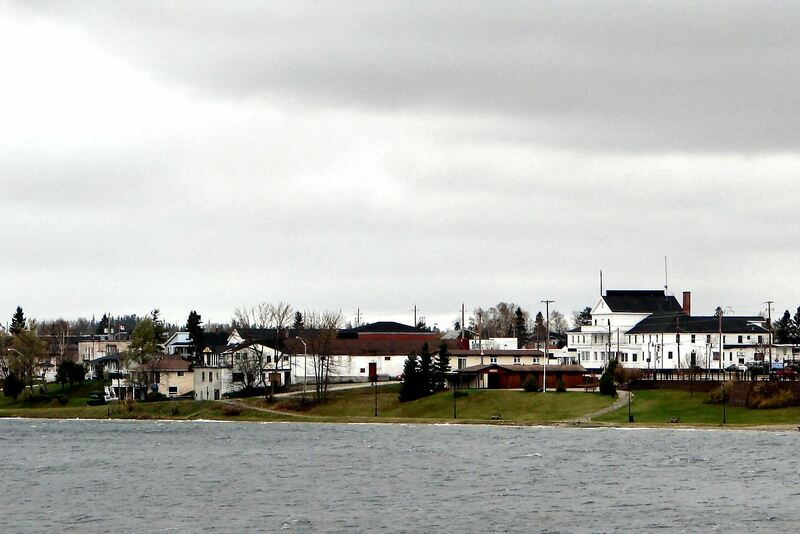 Back on highway 17 heading east we soon came to the small Ontario town of Petawawa. Kit want’s to stop to see if she can actually pet a Wawa but I assure her that there are plenty of Wawa’s at home to enjoy. Just west of Ottawa we take highway 138 Sud toward the border town of Cornwall, Ontario. At 1610 we crossed the border into New York State and encountered our first surly border guard. She seemed to be upset that we decided to return to the US today and asked a number of inane questions. Patiently and politely answering them all she then wanted to search the trailer. When I attempted to get out of the truck to unlock the door she snapped “Stay in the vehicle, sir”. So I handed her the keys and watched in the mirror as she struggled with the camper door for a few minutes. Eventually she came to the window and asked that I unlock the door, which I gladly did in about two seconds. She then decided that she didn’t want to search the trailer after all and waved us on. I think I heard her fellow border crossing folk’s chuckling as we drove off. Ahhh….sweet revenge. 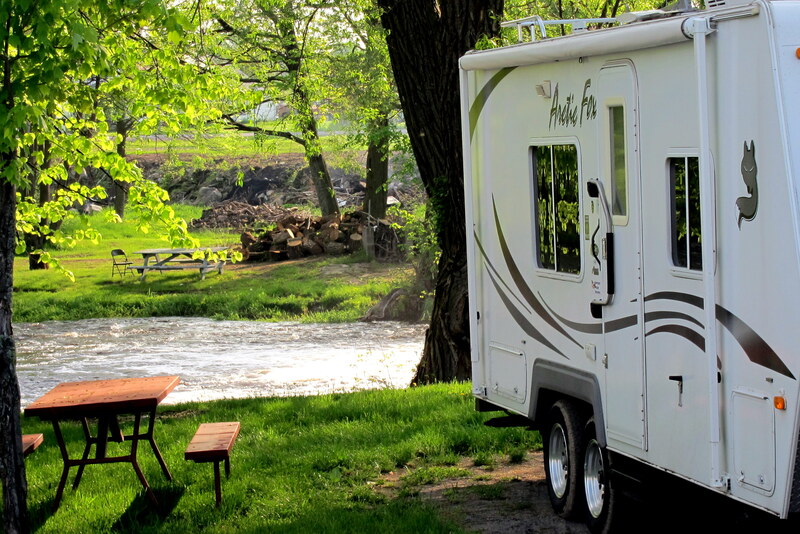 We hopped on NY-37 heading east and soon came to a nice looking campground just outside Westville Center, NY. 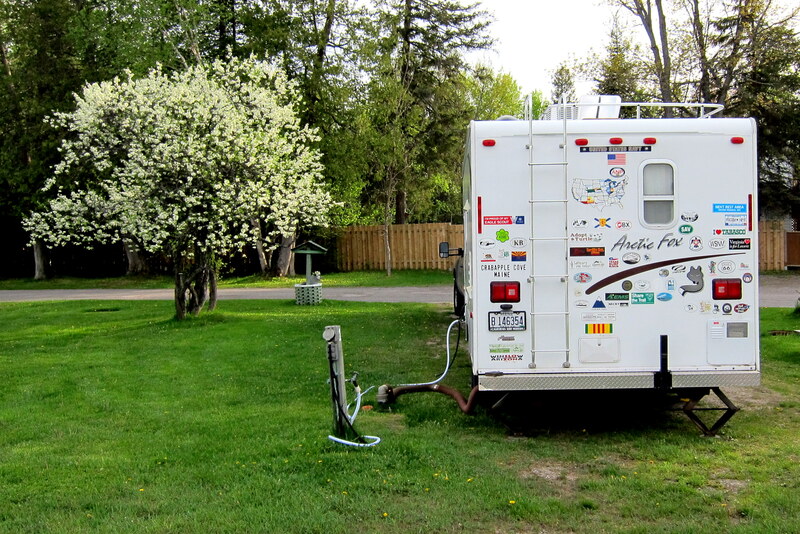 However it also looked pretty full…..kind of weird this early in the camping season. Upon pulling in the reason became clear when we encountered a large banner that read: “Welcome to the 1st Annual Babbling Brook Bluegrass Festival”. Our road magic continues as they had an available site. Backing into a very nice site next to the river we set up for the evening. This is the most camping neighbors we have had in over a month. 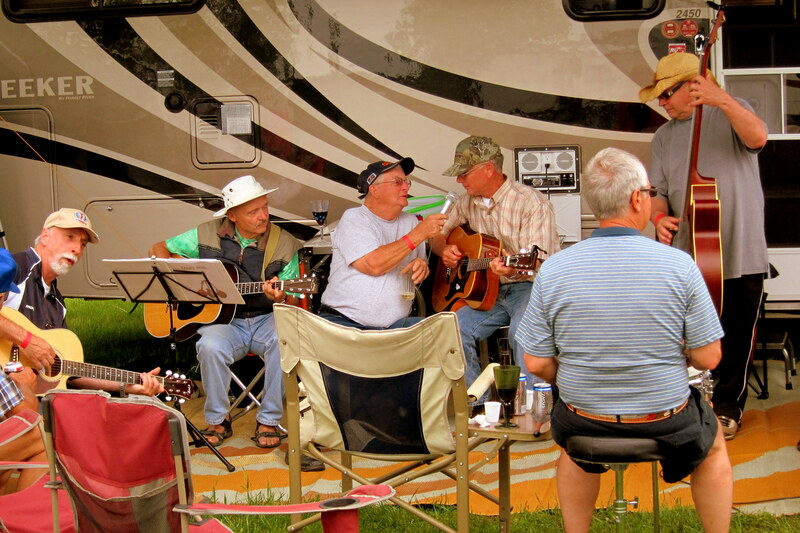 Even though the days performances were over there were a number of Jam sessions scattered about the park. One seemed to be drawing the largest crowd so that is where we went. As I stood enjoying the music I noticed a bottle being passed around. When it came to me I didn’t want to cause an international incident so I took a pull off the jug of Canadian Whisky. This happy ritual continued until the performers couldn’t make their fingers work anymore and everyone stumbled back to their campers. Monday, May 23, 2011: Woke at 0600 feeling a little fuzzy headed. After breakfast we hit the road at 0800 under sunny skies and a temperature of 68 degrees. On NY-122 we headed east until we came to US-11. This led us to Rouses Point, NY where we stopped for big breakfast at a nice little diner. Crossing Lake Champlain into Vermont, we continued easterly. 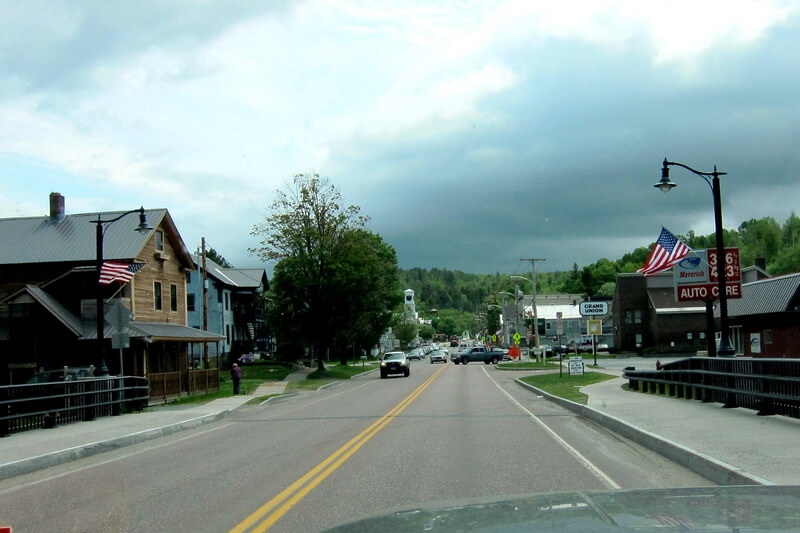 We were on a half dozen different state highways as we picked our way across northern Vermont through the towns of Saint Albans, Fairfax, Johnson and on toward Saint Johnsbury. Stopping at Joe’s Pond picnic area for a break we were pleasantly surprised that this part of the world had not changed much in the past 30 years since we lived here. 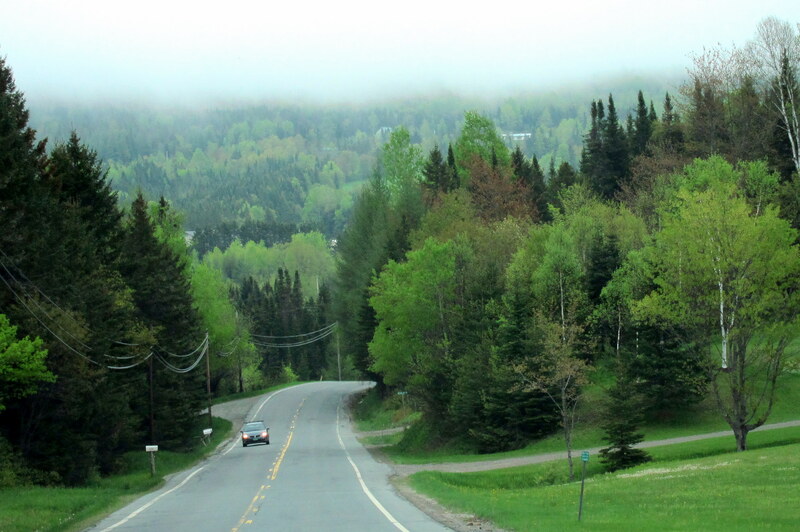 We still contend that Vermont has the nicest scenery of any inland state in the nation. Miles and miles of two lane highways meandering through small towns that have let the modern hectic life pass them right on by. Picking up US-2, an old familiar route from our days living in Vermont, we meandered our way through New Hampshire and on into Maine. Near Bethel we hopped on US-26 and stopped for fuel and coffee in Norway where Kit began texting our ETA to the kids. Moving over to ME-196 in Lewiston we pulled up to our own dooryard at 1720 and were pleasantly surprised by Kim and Joe waiting by the driveway to great us. It is kinda weird…..near the end of a trip we can’t wait to get home. However in a few months we will long for the simplicity and adventure of the open road. We believe the way we currently have it arranged; four months RV’ing, four months at the lake, and four months at home is the perfect balance for us…..so far. Thanks to all who put us up and to all who put up with us over these past four and a half months. We will be forever grateful for your kindness, hospitality and friendship. We always extend an invitation to folks we meet during these trips to come visit us in Maine. Well this summer we are delighted to report that three couples are taking us up on our offer. We are very excited about hosting Dewey and Bea, Rod and Gloria, and Tommy and Martha. 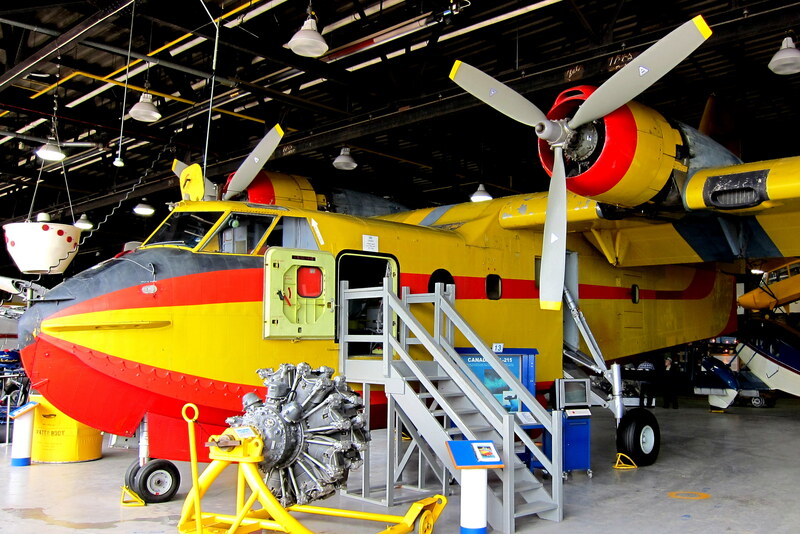 We promise we will make your visit to Maine one to remember! In addition, as an added bonus, Our Las Vegas daughter Suzie is coming to New England for a conference and will be bringing Tucker with her for a week’s stay with us. 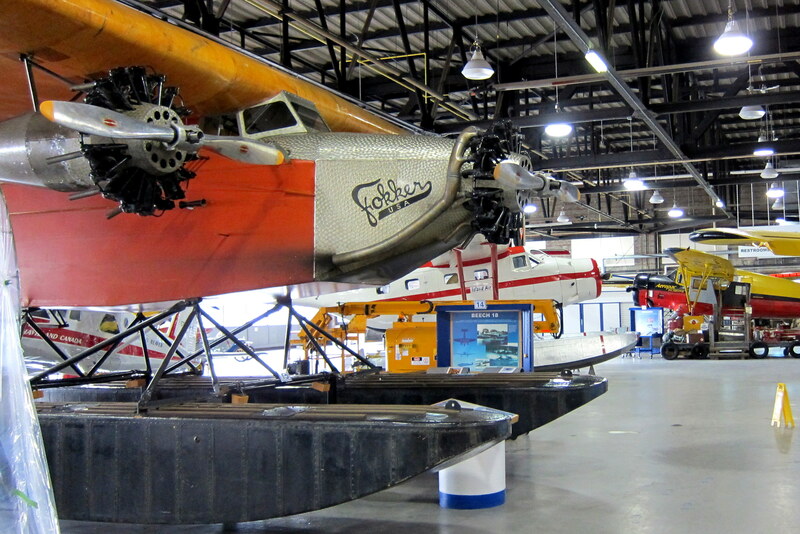 Kit’s Very Valuable Input: I thoroughly enjoyed visiting Sault Ste. Marie, Michigan. We were able to spend an entire day at the Visitor Center at Soo Locks and to be able to watch a few huge ships pass through. 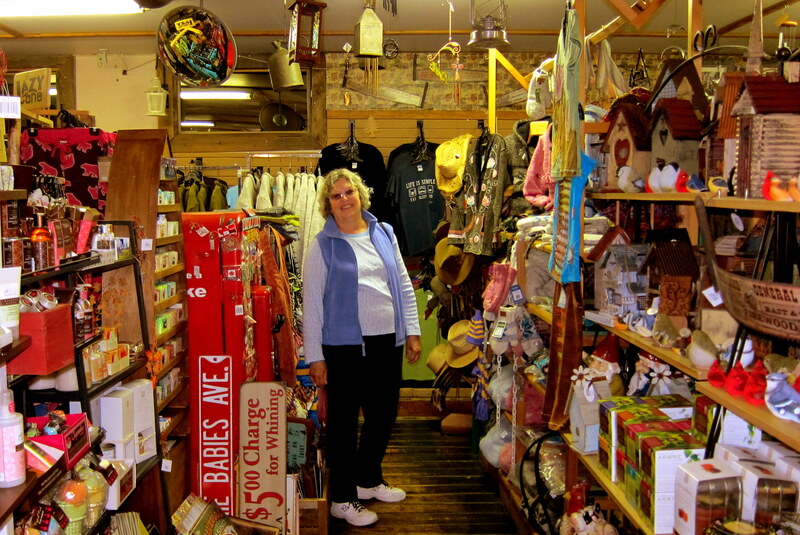 While Bill was visiting various other places in the area, I took the opportunity to browse through a few shops. It was the beginning of the season so most places were just setting up. Back at the campground, we watched several of the boats pass by on their way to and from the locks. Since they operate 24/7, their horns woke us up several times during the night, but it was exciting to watch, no matter what time of day or night. Would love to go back there someday again. But it is GREAT to be home with our family and looking forward to the visit of Suzie and Tucker next month, as well as all the other friends visiting this summer. So envious of your wanderings! You are truly blessed…to have each other AND the time to take these marvelous trips! Thank you for sharing with all of us! You are welcome…..glad you enjoyed them. Hope we can visit on our next swing through SoCal. You are very fortunate in this economy to be able to do the traveling that you have been doing—-the rest of us can live vicariously through your blogs as you explore and share your discoveries. Many thanks and welcome back to Maine! Thanks…..it’s good to be home. Looking forward to seeing you folks soon. We’re glad you guys got home safely, it looks like another beautiful trip was had. We’re looking forward to seeing you guys in August. We are heading off to Yosemite for six days starting tomorrow, 6/6/11, and hope to get a little relaxation for a week. Have really enjoyed you adventures and the memories some of them have evoked from our own past adventures. Glad you’re home and looking forward to carving out a little time in your (and our) busy schedule to catch up with each other in person at one lake or the other. Welcome home!…. I have something for you…hehe. Thanks, looking forward to seeing you folks as well. After all, our camps are what…..10 minutes form each other? If what you have is what I think it is…..I’m already drooling. Oh Senior Chief, what kind of nautical terminology is “a large 1000 foot Ore Carrier trundled past” Turn in your ESWS pin. Glad to have you back in the Pine Tree State. Like the little girl said, There’s no place like home. Don’t forget…..I’m a product of the Zumwalt Nav, we modernized the old stodgy Navy. Good to be back, now to acclimate!!!!! You folks have shown us places we never knew existed in the beautiful country of ours We really enjoyed the history, folks you met, small town comforts and I could go on and on. I respect what you say that’s it’s good to be home but will soon be itching to get back on that open road. Thank-you for sharing such a fantastic trip with us and for being our guest’s for dinner. It’s really wonderful that old friends seem to fade to the past and return to the future. Thanks for the nice comment’s and kind words. Visiting you folks was one of the highlights of the trip. We can’t wait to see you in Maine this fall. Have a great summer! KATHERINES COVE LOOKED MORE ~WILD AND BEAUTIFUL, SORRY BILL NO POINTS. ?? TRANQUIL! YOUNGS STORE HAD A GREAT SIGN YOU PASSED UP, NAKED BABES AVE, NOW THAT’S WOULD HAVE LOOKED GREAT AT THE ENTRANCE TO YOUR LAKE PROPERTY. JEANNE, KIM, AND I WERE IN ONTARIO BACK ABOUT 42 YEARS AGO. WE VISITED FRIENDS IN NILES MICHIGAN AND THEN CROSSED AT THE SOO AND UP THE WEST SIDE TO A PLACE CALLED WILDERNESS LODGE. I REMEMBER IT WAS CLOSE TO ELLIOT LAKE AND A BIG COPPER MINING OPERATION. THE LODGE WAS 60 MILES FROM THE HIGHWAY AND ALTHOUGH WE DIDN’T CATCH ANY, IT BOASTED SOME TROPHY RAINBOW TROUT. THE OWNER HAD BEEN IN THIS LOCATION SINCE HE WAS A YOUNG MAN AND LEASED A HUGE TRACT OF LAND FROM THE CANADIAN GOVERNMENT. HE RAN A MASSIVE TRAP LINE AND MADE HIS LIVING OFF FROM THE LAND. MUCH MORE TO THE STORY, IT WAS SOME WILDERNESS BACK THEN. I HAD AN INDIAN GUIDE AND WE DID CATCH SOME NICE BROOK TROUT. CARRIED THE CANOE ON MY 66 ELDORADO CADDYS WINDSHIELD AND ON THE TRUNK USING PILLOWS. IF JEANNE EVER SAW WHERE THAT CRAZY INDIAN AND I TOOK THAT CAR, SHE WOULD HAVE DECAPITATED OLD CHETTI. Sounds like a great trip. Especially since you took in a bluegrass festival and passed through my birthplace (St. Johnsbury). 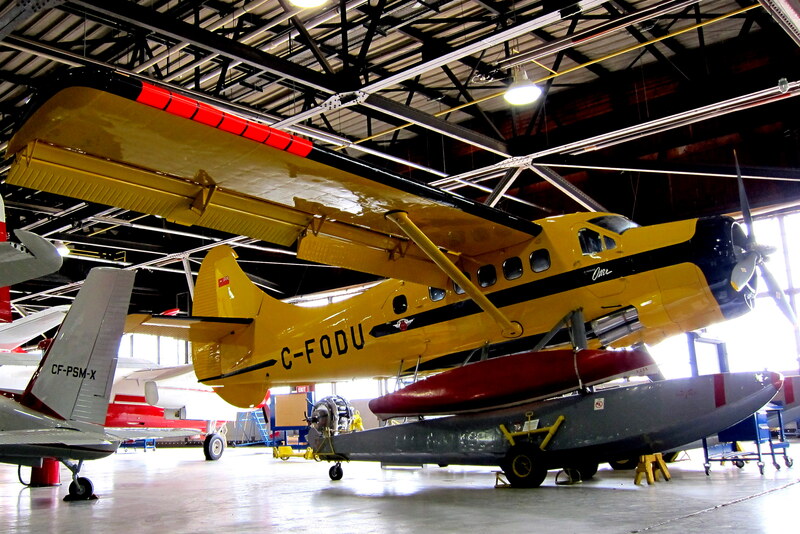 It was a great trip…..so much fun we’ll do it all again next winter! Loved Vermont…..used to live in Barre and may have stayed if the job opportunities had been better. Thanks for visiting the website.